When Bill Sinkin first approached CPS Energy about promoting solar power, officials were amenable, said Joe Fulton, who was director of environmental planning and research at the time. A change in leadership delayed the agreement, but since it was inked in 2002,CPS Energy has remained the major sponsor behind Solar San Antonio as Sinkin built it into a force that has helped turn San Antonio into a solar power leader. Hundreds attended Sinkin’s funeral at Temple Beth El, for he touched so many lives in his roles as civil rights pioneer, interfaith advocate, banker, community activist and chairman of HemisFair, the event credited for catapulting San Antonio onto the national stage. He was in his 80s when he turned his full attention toward advocating for solar power. Sinkin constantly pushed CPS Energy to go farther in its embrace of solar, and with the arrival of CEO Doyle Beneby and his commitment to “big solar,” he grew increasingly gratified as CPS Energy became a leader in utility scale solar while continuing to support the expansion of rooftop systems. 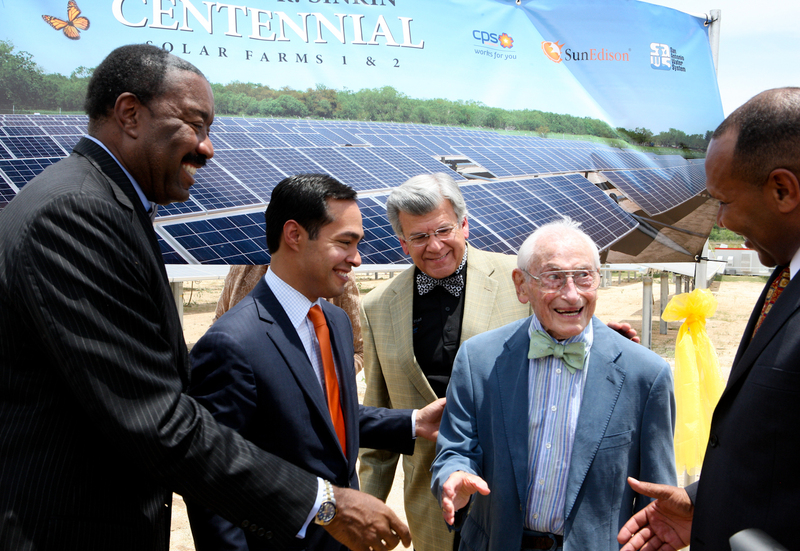 In June 2012, Beneby, Mayor Julián Castro and other leaders honored Sinkin when they dedicated the 19.8 MW farm on land owned by the San Antonio Water System as the William R. Sinkin Centennial Solar Farms 1 and 2. CPS Energy Doyle Beneby, left, with Mayor Julian Castro and SAWS Chairman Berto Guerra congratulate Bill Sinkin. But it took longer than Sinkin would have liked for the world to embrace solar power. Back in 2000, CPS Energy’s newest customer service center, on San Pedro and Oblate, was being built with what was then state-of-the-art energy efficiency measures, including both solar hot water and solar photovoltaic systems, thanks in part to Sinkin’s influence. So when Sinkin asked that CPS Energy support his idea for a solar advocacy group, Jamie Rochelle, then general manager, green-lighted the idea. In its first years, Solar San Antonio worked diligently to get the word out — the sun’s power was there for the harnessing, and in sweltering South Texas, it ought to be a no-brainer to wire up every home, school and business in the region. But solar prices remained stubbornly high, and for many years, the organization was successful mostly through the sheer will of its founder. CPS Energy first offered the rebates for solar installations in 2007, and paid out 60 residential and commercial installations through 2009. In 2010, Solar San Antonio launched its Bring Solar Home campaign to encourage the greater utilization of solar. Promoting the CPS Energy rebate, the federal tax credit, and three free estimates from local solar installation companies, the campaign helped to catalyze rapid growth. Installations increased each year to the point that San Antonio now boasts more than 1,400 residential and commercial solar installations as of this month. Nationally and internationally, the rapid growth of solar forced prices down, and is now affordable for modest income households at $3.85 per watt. That’s down from $7.50 per watt in 2007. The combination of reduced price, CPS Energy’s rebate, the federal tax incentive and depreciation also make solar very attractive for businesses and schools. Thanks to early support from CPS Energy and an unwavering vision from Bill Sinkin, who understood long before most people that the sun would play an increasingly important role in our energy future, the solar industry is thriving here, with more than 300 people employed by dozens of local installation companies. That’s according to a May 2013 survey of 17 local solar installation companies by Solar San Antonio. Currently, 44 local solar installation companies are registered with CPS Energy. Over the years, CPS Energy and Solar San Antonio have collaborated to build public support for solar energy through workshops, power breakfasts, and presentations, not to mention our annual Solar Fest, which gives the public the opportunity to interact directly with local solar installers and other businesses focused on energy efficiency and sustainability. Homeowners and businesses in the CPS Energy service territory have invested $68 million to go solar thus far. The city now has 15 megawatts of solar capacity through installations on household and commercial rooftops. That’s a lot of sun power — and it’s only going to grow. Thank you, Bill Sinkin, for all you’ve done for San Antonio. It was an honor for any of us to have known Bill Sinkin. He was a true visionary and left the world a much better place for having been here.